J.D. Greear featured this as one of the summary statements of the church he serves at. I don’t remember hearing it before and it encapsulates that the Gospel is not an entry point, it’s what Christians enter into. Categories: Gospel, Grace | Tags: Gospel, J.D. Greear | Permalink. Daniel Stern posted this touching reunion with a Home Alone Co-Star. Categories: Animals, Movies, Popular Culture, Spiders | Tags: Home Alone, Movies, Popular Culture | Permalink. You may want to hear this more than once, so here’s two versions. Categories: Music, Songs | Tags: Julien Baker, Music, Something | Permalink. Air New Zealand’s flight safety announcements leave everyone else for dead. Why can’t we have these in Australia? Categories: Fun, Travel | Tags: Air New Zealand, Fun, Travel | Permalink. 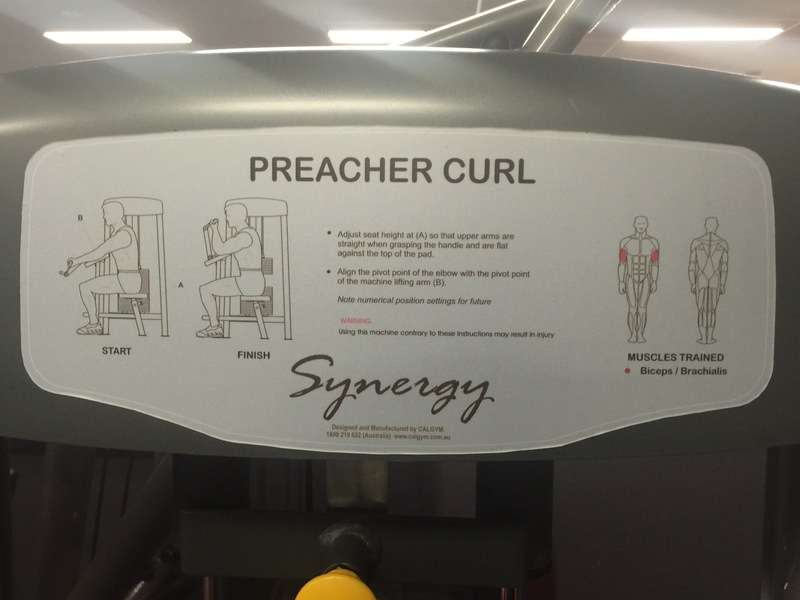 There’s an apparatus at the gym for a biceps exercise called the Preacher Curl. The Internet seems a little foggy on the origins of the name, except the exercise is supposed to look like when preachers gesture for folk to come forward at an altar call. I don’t know how anyone knows what that looks like, everyone’s supposed to have their eyes closed in prayer during the altar call. Categories: 1 | Tags: Exercise, Ministry | Permalink. Hiding Place, a new track by Josh Garrels. Categories: Music, Songs | Tags: Hiding Place, Josh Garrels, Music | Permalink. From a post by Geoffrey Kirkland about pastoral burnout, its causes and cure. Since the pastor’s task is utterly impossible in the strength of the flesh, how does a saved sinner, a weak man at best, take up this task and perform it well for the glory of the Savior? Experts and statisticians provide a host of data about what “successful” pastors do and what needs in the lives of such pastors have been met. But I propose that a pastor has one singular, ultimate need: The pastor must guard his own heart. God’s Word stresses the importance of the heart over and over again. God implores us — and this is particularly important for ministers — to watch our hearts carefully. Proverbs 4:23 says, “Watch over your heart with all diligence, for from it flow the springs of life.” Jesus said that “from within, out of the heart of men, proceed the evil thoughts, fornications, thefts, murders, adulteries, deeds of coveting and wickedness, as well as deceit, sensuality, envy, slander, pride and foolishness.” He continued, “All these evil things proceed from within and defile the man” (Mark 7:21-23). Jesus also proclaimed that every man’s “mouth speaks from that which fills his heart” (Luke 6:45). Paul tells Timothy, his young protégé in the faith, not to neglect the spiritual gift within him; to that end, Paul exhorts him, “Take pains with these things; be absorbed in them, so that your progress will be evident to all. Pay close attention to yourself and to your teaching; persevere in these things, for as you do this you will ensure salvation both for yourself and for those who hear you” (1 Tim. 4:15-16). A pastor’s own ministry will be no better than his heart; indeed, a healthy ministry flows from his heart and will reflect the state of his heart. So the implication is clear — a pastor must guard his heart. It is possible for a pastor to become so concerned with the hearts of those in his flock that he neglects his own heart. This is tragic. Categories: Black Dog Mondays, Ministry, Pastoral Helps | Tags: Black Dog Mondays, Ministry, Pastoral Helps | Permalink.